Lifeisgrand: Azores 2018 : Day 13 - Man this place is hilly! Today we decided to take a road trip around the western half of the island. We had our first taste of driving yesterday and learned two things: Madeira is very hilly and the integrated GPS on our car is an absolute piece of rubbish. Today, we would confirm both points. Our first target for the day was Cabo Girao, an extremely high lookout point with a glass skywalk you can stand on and look straight down 580 metres to the ocean below. Five minutes after driving away from the apartment into the chaotic streets, we realized we had forgotten our little internet machine, but decided we couldn’t bear turning back so would rely on the car GPS. Bad move. I tried to find the Cabo Girao but it didn’t appear on the GPS search so I put in an approximate address, and the GPS led us into the greasy guts of a nearby village, passing locals with their wide open stares, making turn after turn as the GPS directed us, laughing, and eventually we ended up wedged into a street (pathway) that was just wide enough for the car to fit into if we folded both side mirrors in, which we did. I noticed copious amounts of car paint smeared onto the walls on both sides, so I slowly reversed out of the trap, managing to avoid scraping the car, and then pulled over to collect my thoughts and figure out our next move, while letting my red-hot firing nerves settle for a moment. Far ahead I saw a tourist bus, so I rammed it into gear, caught up to him and followed him closely, assuming he must be going to the same place we were trying to get to. That assumption proved correct, but three quarters of the way up the steep mountain we hit clouds, and by the time we got to the top the visibility was down to 25 metres at best, just enough to see the dozens of tourist busses lined up in the parking lot, and the endless stream of tourists walking around in the dense fog, like high altitude ants, taking senseless pictures of grey moisture. We took a pass on this one and headed back down the other side of the mountain, following a different tourist bus with Blandy Travel stamped on the side. We continued down an endless series of switchbacks, braking until I smelled them, and then resorting to a downshifting strategy, stressing out the poor clutch. Our mystery guide led us to the town of Ribeira Brava and we found a parking spot so we could check the place out. It was a cute little village, on the ocean, with a shopping area and several cafes on the water. Down here at sea level the sky was mainly clear, and the sun was slowly starting to heat up. We began by walking up an interesting looking and steep path on a side street. The path was built with poured concrete, but then small, apricot shaped rocks were placed evenly in the concrete to create a grippy surface for ascending, not to mention a bit of free reflexology for your feet if you weren’t wearing shoes. The path led up to a mountain road and afforded a stunning view over the town. Well, it’s not weird, it’s just science. Anywho, I stuck my pinkies in my ears and ran right by the clones and over to a cafe well out of earshot and ordered a decaf coffee and pastel de nata, which wasn’t nearly as good as the ones in the Azores. The rest of the gang joined me for drinks, and we played cards at the table until the wind started blowing them all over the place. 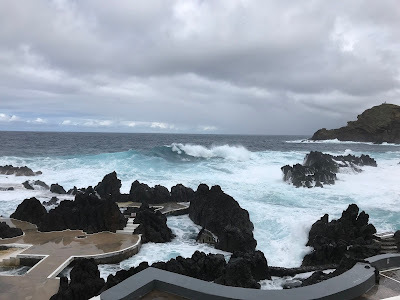 By then, our parking time was running out and the fun level was waning, so we returned to the car and headed north across the island for Sao Vicente. Here, we found a sign pointing to the “Grutas”, which means caves, and the Olson family just loves their caves. This type of cave was new for us as it was a volcano lava tube where the hot lava flowing down the volcano cools on the outside while the hotter lava continues to flow on the inside, all the way down to the sea, eventually emptying out the tube, leaving a long, tunnel-like cavern. The entire tour lasted an hour and yes, it was touristy, but still pretty good. For some reason they had rigged up the cave to stream music, but instead of piping in the theme music from Indiana Jones at maximum volume, they were playing this ultra-tranquilo, barely audible, hypnotizing classical music. Since most of the tourists had at least 20 years on us, I’m thinking they used this to tranquilize the touristos and prevent anybody from having a claustrophobic spaz attack in the narrow tunnel. One member of our tour group did sustain an injury however. He was very tall and capped his noggin on a piece of jagged lava rock and had blood pooling on his skull, getting all mixed in with his grey hair. But he bravely went on, after the tour guide told him if he didn’t then he’d have to backtrack by himself to the entrance. He didn’t want to be all by himself in a lava tube cave. At the end of the tour we had a chance to make a wish at an underground cavern pool. My life is currently damn good, so I just wished for a delicious lunch. We returned to the car and the road lead us westward across the north coast. The views looking out over the angry sea were gobsmacking, but I was equally impressed by the amazing engineering work and imagination it must have taken to create such roads, bridges and tunnels through an intensely inhospitable environment. There was also an old coastal road, which was meant to be quite terrifying to drive, but sadly it was closed, so I didn’t get to put my family’s safety seriously at risk. We reached Porto Muniz at the furthest point north-west and stopped for a mediocre lunch (that wishing pool was a hoax! ), but a great look at the massive surf and waves crashing into the shoreline. They had an area of natural pools, but they looked to be not yet open for the season, anyway you’d have to be suicidal to go swimming in there now as you would get mashed up on the rocks in no time and lived the final moments of your life dropping down into the blue depths, watching the lapas clams stuck to the rocks, wound up with bunches of pale green sea grass as you sink down to your watery grave. That’s no fun. The sad, sad GPS took us through a few wrong turns, but eventually we sniffed out the way up over the mountain to round the coast and start working our way back to Funchal. At altitude, we hit thick clouds and rain and strangely there were no tourist busses to follow, or any other cars, and the further we went, the fewer signs of civilization appeared, and we were soon in the middle of a Stephen King movie where we were all alone on the road, trapped by clouds, surrounded by monsters in the mist, hoping for the best, yet fearing the worst. At times, there would be a small break in the clouds, and I’d catch a momentary glimpse of what looked like the thick leg of a giant spider, spooking me out, until I realized they were wind turbines, planted right beside the road. We seemed to be passing through a high altitude plain, as the forested had dwindled to nothing and left only flat ground and scarce patches of wet grass. A roadblock appeared ahead of us with a big dead-end sign, but the roadblock covered only our lane. Since there were no other roads nearby and the ones we had passed didn’t look like they connected to anything, we passed around the blockade and continued. As we drove, we saw that large rocks had fallen from above and had accumulated in the opposite lane, making the path rather treacherous in the thick fog. We drove for 10 kilometres and then finally hit a full roadblock, forcing us to turn back, retrace our path, avoid the rocks, and take the next exit heading south. The road was narrow and started leading us down twists and curves, in steep decline, but hopefully towards the coast. Then as quickly as we’d entered the clouds, we were out of them, and the bright sun shone down on us, giving us a glorious view of the sea to the south. We continued all the way and thankfully made it back to a main road, and drove east, passing through several villages, on the way to Funchal. We hit the village of Ponta do Sol and were struck by the sheer quantity of banana trees - they were literally sprouting out of every, single available patch of earth. Here’s a trivia question for you: how many bunches of bananas will a single banana tree produce in its lifetime? The answer? Exactly one. After that, the full-grown banana tree is cut down and one of the children plants that sprout from it is left to take its place. The last six minutes of our drive home were hairy. As we were driving down one of the main roads into the centre of Funchal, the GPS demanded we immediately turn left, so I turned (foolishly) right into the oncoming traffic of the one-way street. I reversed out, spun the car, and continued back down the street and took the next left instead. The stupid GPS caught up and, after one or two blocks, told me to take the right exit straight up this incredibly steep street; so steep in fact, that I needed to rev up the car as fast as it would go to gather up enough momentum to take us to the top. I expected it was taking me in the wrong direction, but I didn’t have any better ideas, so I held my breath and drove like Mario. As we rounded the top, I couldn’t see any street ahead of me, because this street went straight back down, but even steeper than the ascent, giving us the sensation of a world class rollercoaster. The best part was that I was faced with a yield sign at the top, but by the time I realized it all four wheels were off the ground and the Dukes of Hazard song was playing, so we soared right by it and landed ever so smoothly on the downward slant, like a champion ski jumper, barely missing the cars miraculously parked on both sides of the street (European emergency brakes are obviously engineered to the highest standards). I squealed to a stop at the uncontrolled intersection at the bottom of the hill and then proceeded left for half a block right to our gate entrance, where there was already another car ahead of me on his way in to steal my parking spot. As he waited for the automatic gate to open I scooched in behind him and waited. Then he bolted up the driveway and, since the gate was wide open, I followed him, but as I passed, the red and white striped arm of the safety barrier began its decent, aimed precisely for the hood of my car. My animal brain kicked into gear and I slammed the car into reverse, pounded the gas, popped the clutch, and lurched backwards into the traffic, with my wide-eyed children screaming and shitting their pants in the back seat. I think Ana was in shock because she wasn’t saying anything, and that’s very abnormal. I rammed the brakes inches before impact and fortunately all the pedestrians had already seen the rental car sticker in the back window of my car and leaped out of the way. I fished the gate card out the console with my longest fingernail, held it up to the sensor, and watched as the dangerous arm lifted back up to let me pass, and pass I did, with wheels torqueing like mad to get up the steep driveway. How happy was I when a single empty parking spot was available! I drove the car past the spot, slammed the brakes and ordered everybody out. My weary, shell-shocked passengers bounded out of their seats and jumped clear of the car before I rammed it into reverse and squeezed the little Clio into the parking spot, like a pro, with inches to spare on either side. It was a fine bit of piloting if I do say so myself. The rest of our evening was comparably blissful - dinner at nearby restaurant, complete with Madeira wine for aperitif, and then a lovely stroll around the neighbourhood. And the car would sit silently in its spot for 36 hours.